Yes, that’s not a surprising feeling to have. Mountaineering will do that to you, but you’ll find moments of spiritual beauty up at those heights, and you find out about yourself in the course of that struggle and you’ll come back a different person anyway. You mean to say I’ve become a different person five times? Climbing a mountain is a physical and mental challenge, among the most intense and demanding that a human being can undertake. To say this is to do no more than faithfully echo the thoughts expressed in the many millions of words written about mountaineering endeavors. But they don’t quite capture the sheer just-been-through-twelve-rounds-with-a-prizefighter feel that a climb at high-altitude in freezing weather can inflict on you. (I say this as someone who, despite having hiked a fair amount at high altitudes has only flirted once, briefly, with anything approximating a mountain climb, and that was on Stok Kangri, a hiking peak!). That feeling of having been battered around by the elements and the implacable mountain can generate, sustain and stoke the relentless competitive desire, in some sufficiently motivated beings, and evidently in my nephew, to ‘beat’ the mountain, to ‘overcome’ it. 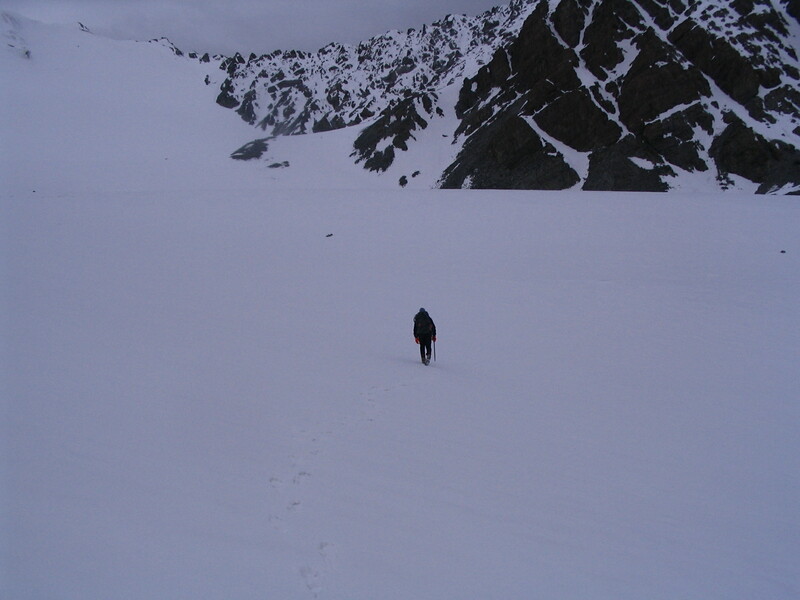 But the mountains also afford us–again, as so many have noted–ample opportunity and space to experience incredible, soul-awakening beauty (like, for instance, the open, silent, cathedral-like snow-field in a glacier basin crossing on Stok Kangri below; click on the image for a larger version). Quite simply, it is the juxtaposition of such sublime beauty with harshness and physical discomfort that ensures that even as mountains may make us regard them as barriers to be overcome, they continue to retain their ability to reach down into our being, unsettling, rearranging and morphing it into something that will retain indelible traces of that encounter. Up there, among the snow and the crags, lurk many spaces for enabling a new understanding of oneself. Go up and come down; a make-over cannot but ensue. A hard-earned one. Note: I’ve written here before, briefly, on the relationship that mountaineers have with the mountains they attempt to climb. In one post, I noted the problematic adversarial language that is often deployed in writing about mountaineering, and in another I sought to move the focus in mountaineering language away from individual effort to collective action. This entry was posted in Fitness, Mountains, Philosophy, Photography, Travel and tagged garhwal himalayas, Kamet, Ladkah, mountaineering, self-discovery, Stok Kangri, Trishul.